What we will be using to write, organize, and refactor our code. "Buildship is a collection of Eclipse plug-ins that provide support for building software using Gradle. 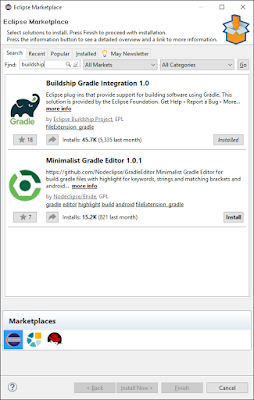 Buildship aims to provide a deep integration of Gradle into Eclipse. Buildship also aims to make the Eclipse IDE more powerful by allowing the user to do more from within the IDE. Buildship 1.0 is targeted towards Gradle users. Later versions will target Gradle build masters". What we will be using to annotate our test methods, declaring if a certain method is a @Test itself, if the method should be run @Before or @After each and every individual test is run. JUnit is the once and future test framework. First written by Kent Beck and Erich Gamma back in 2000, it received an major update, JUnit4, in 2005. Because the next version, JUnit5, still in it’s Alpha release we haven’t adopted it yet at work. @Before: Good for setUp() methods. Runs before each and every @Test. @Test: It's our @Test Method. @After: Good for tearDown() methods. Runs after each and every @Test. We are evaluating the actual conditions of what is happening in the test against the conditions of the test. For example, we "assertThat(actualString, is(equalTo(expectedString)))" or "assertThat(actualBooleanValue, is(true))” or "assertThat(1, greaterThan(3))". With most of our browser tests, we take a piece of text we find on a page such as a page title, a heading, or a price, place it in a String, and compare it with the String value we were expecting. Go to https://eclipse.org/downloads/ and download Eclipse. It should direct you automatically to the Mac or a PC version. Once the Zip file is downloaded, extract all to where you wish the program to be installed, such as in C:\\Program Files. Go into the new Eclipse folder and double-click the icon to run the program. In Eclipse's top menu, go to Help -> Marketplace, and search for the keyword "Buildship". Check to see if it is installed. If not, press the Install button. 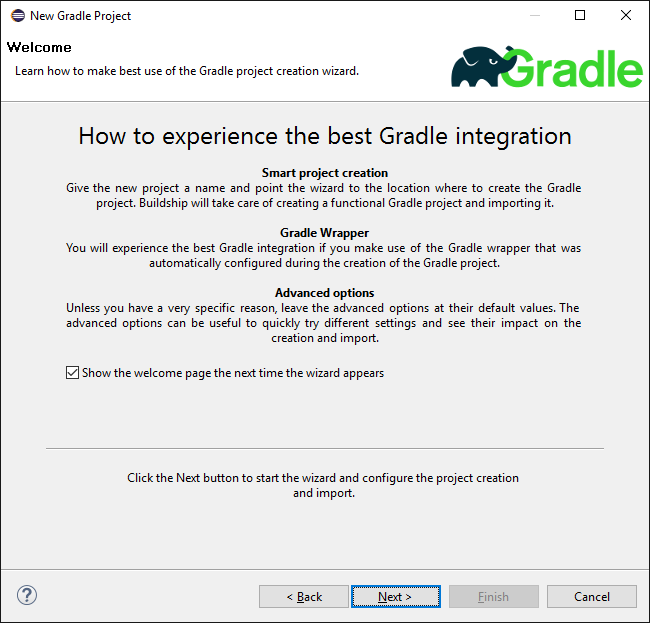 On the Select a Wizard screen, choose Gradle -> Gradle Project. What would you like to call your project, and where would you like to put it? I am always juggling multiple projects, switching from Java (both with and without WebDriver) and Python. I created in my Home Directory (C:\Users\tmaher in Windows) a folder called "code". In that folder are the subfolders "java" and "python". And under each of those are subfolders called "selenium", since I have been attempting to write testing frameworks with Selenium WebDriver bindings in both Java and Python. src/main/java folder: The home for our main codebase. src/test/java folder: Historically, the home for our unit tests that check our main codebase. 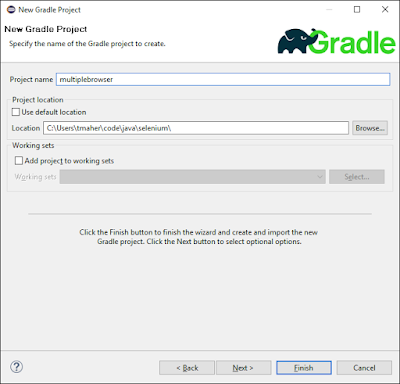 "Gradle is a general-purpose build tool. It can build pretty much anything you care to implement in your build script. Out-of-the-box, however, it doesn't build anything unless you add code to your build script to do so. "Most Java projects are pretty similar as far as the basics go: you need to compile your Java source files, run some unit tests, and create a JAR file containing your classes. It would be nice if you didn't have to code all this up for every project. Luckily, you don't have to. Gradle solves this problem through the use of plugins. 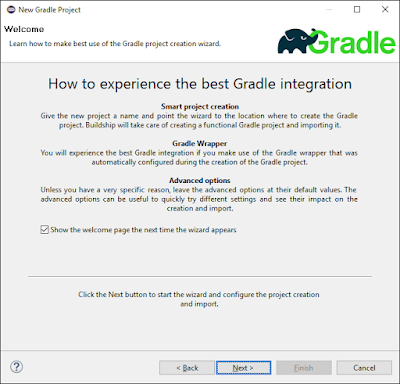 A plugin is an extension to Gradle which configures your project in some way, typically by adding some pre-configured tasks which together do something useful. Gradle ships with a number of plugins, and you can easily write your own and share them with others. One such plugin is the Java plugin. This plugin adds some tasks to your project which will compile and unit test your Java source code, and bundle it into a JAR file". - The Gradle.org UserGuide, Java Projects Tutorial, Chapter 44. ...Let's swap out the text "jcentral()" to "mavenCentral()". Er, I am more used to Maven Central. "This is all you need to define a Java project. This will apply the Java plugin to your project, which adds a number of tasks to your project. 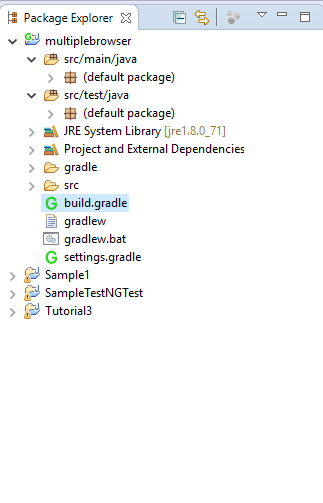 "Gradle expects to find your production source code under src/main/java and your test source code under src/test/java. In addition, any files under src/main/resources will be included in the JAR file as resources, and any files under src/test/resources will be included in the classpath used to run the tests. All output files are created under the build directory, with the JAR file ending up in the build/libs directory". "Usually, a Java project will have some dependencies on external JAR files. To reference these JAR files in the project, you need to tell Gradle where to find them. In Gradle, artifacts such as JAR files, are located in a repository. A repository can be used for fetching the dependencies of a project, or for publishing the artifacts of a project, or both. For this example, we will use the public Maven repository". The Maven Central Repository is at http://search.maven.org/. You can also search a much more user friendly site, http://mvnrepository.com/. How did we know what to put in the dependencies? Take a look at MVNRepository. It shows what to use as dependencies in Maven, Gradle, or other systems. 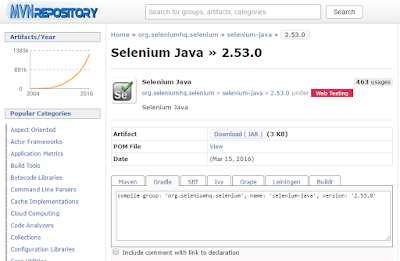 You can see at http://mvnrepository.com/artifact/org.seleniumhq.selenium/selenium-java that the latest version is 2.53.0. Select that links. 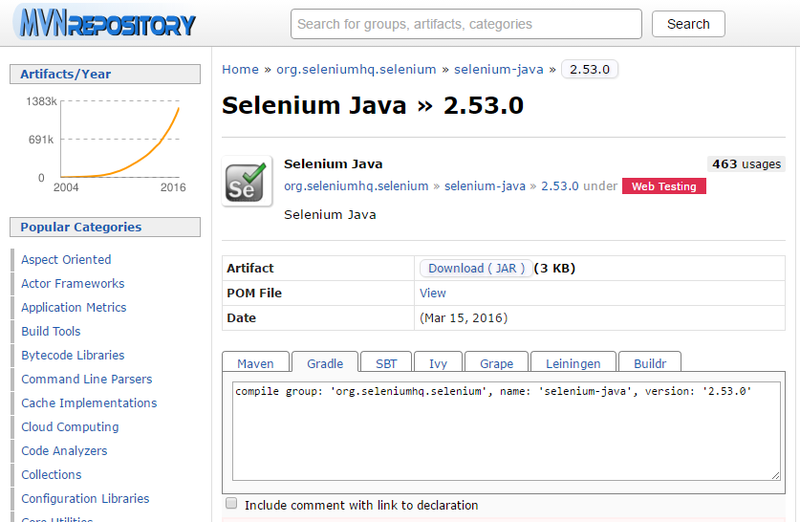 When you are at http://mvnrepository.com/artifact/org.seleniumhq.selenium/selenium-java/2.53.0 select the "Gradle" tab. Want more training in Gradle? 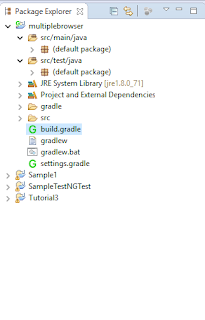 Go to https://gradle.org/udacity-gradle-for-android-and-java-training/ ... Although the course is for Java AND Android development, the first part is a good introduction to the tool. Firefox is built into WebDriver. No need to download anything else. No need to set up System Properties to tell us where the Windows executable (*.exe) file is located. All you need to do is write the test. In the Project pane of Eclipse, go to src/test/java. Highlight the "java" folder and right click on it. Create a new class, call it TestClass, and select OK. Copy and paste the following class. 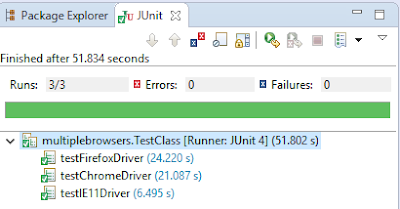 Run all tests in TestClass.java by selecting outside the testFirefoxDriver test block, right click, and select "Run As" -> "JUnit Test". Going to the panel, "Outline", selecting the individual test, right clicking on it, and selecting "Run As" -> "JUnit Test". Open a new Firefox browser. Go to Dave Haefner's test site, The-Internet, in his test login page at http://the-internet.herokuapp.com/login. Using the Hamcrest matching library, it will a) Get the Title displayed in the Firefox WebDriver b) Check that it is equal to "The Internet". If it is okay, it will pass, showing Green. If it fails, it will give an error message. The browser will then quit. What the Outline Panel will look like after all browser tests are constructed. If we want to test how a page looks in Chrome, we are going to have to download and install Chromedriver. https://sites.google.com/a/chromium.org/chromedriver/. But if you install Chromedriver, where would you like to put it? Open the ZIP file, extracting wherever you want to install it. Now, we can write the ChromeDriver test! ... Of course, make sure in that second parameter, replace the "tmaher" with wherever you installed ChromeDriver. Hrm... I am not liking this... there is a lot of code that seems to be duplicated. This violates the biggest principle of software development: DRY (Don't Repeat Yourself). ... Let's remember to refactor after. 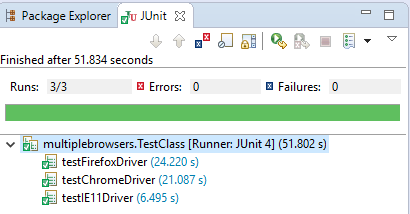 If you run TestClass.java, you first should see Firefox, then Chrome run the test. ... And there's too much code duplication. Although we have written unit tests, and they all pass, proving that our environment was set up correctly, let's refactor the code, making it a bit more clean. Let's run TestClass.java again, making sure we have a good baseline. In the top Eclipse menu, select Run -> Run TestClass. After the browser unit tests pass, verify that they are all Green. 2. Create an @After method in JUnit, to be run after every single test. Let's pull the driver.quit() out of each test method and in a JUnit @After tag. To do that, before the test methods, we need to instantiate a new WebDriver class. Let's call it "driver". * Created by tmaher on 5/30/2016. Right now, we have just the basic installation. We still have a long way to go when it comes to setting up a full-blown automation test framework. We aren't yet using RemoteDriver. We need to set a browser's Capabilities. We aren't using PageObjects or any utility or helper methods. ... But at least we have a pretty detailed walkthrough on installation. We'll use this in the coming weeks, when we convert June 2015's project https://github.com/tjmaher/WebDriver_TheInternet_Advanced into this new style.